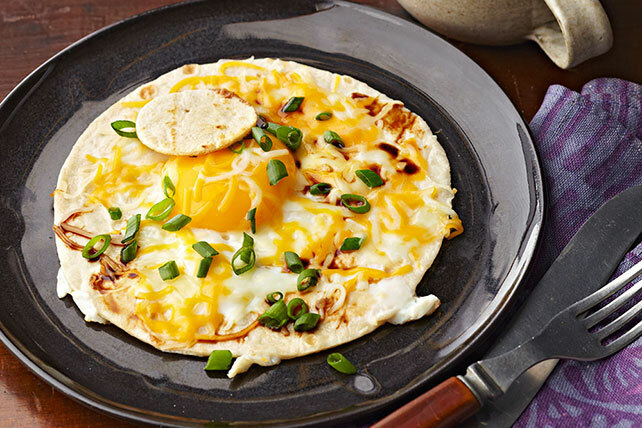 This creative recipe made with eggs and cheese over tortilla actually looks like a sombrero and tastes like the best breakfast recipe you've ever had. Use 1-1/2-inch cookie cutter to cut hole in center of tortilla. Melt butter in small skillet on medium heat. Add tortilla and cutout; cook 2 min. on each side or until each is browned on both sides. Remove cutout from skillet; set aside. Slip broken egg into hole in tortilla; cover. Cook 3 min. or until egg white is set and yolk is cooked to desired doneness. Sprinkle with cheese; cook, covered, 1 min. or until melted. Remove from heat. Top with tortilla cutout and onions; drizzle with soy sauce. Prepare using a corn tortilla. If you don't have a 1-1/2-inch cookie cutter, you can use the top of a small drinking glass to cut the hole in the tortilla.